So Long Lizzy but not Goodbye! Lizzy's gone to meet our Rotarian friends in South America. Last Friday (Aug 15) Fort Yuma Rotary Club Sweet Heart and Outbound Youth Exchange student Lizzy Parker embarked on the first leg of her year long journey to Valle De Los Chillos Quito Ecuador. L-R: Nancy Powell, Karen Griffin, Sue England, Ted Bruner, Ronna Stubbs, Cullum Smith, Lizzy Parker, Dan Montoya, Kelly Boyd, Robin Finn, Mike Gibson & David Carvell. Present but not pictured was John Bornt. Lizzy and her mom and dad, Chris & James, planned to gas up at Shay's Chevron at Pacific & 24th St. on Friday and then board a jet plane out of SkyHarbor in Phoenix on Saturday. 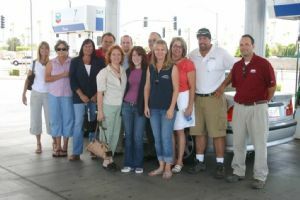 However, before they could make good their escape, Lizzy and her entourage were intercepted at Shay's Chevron by 11 Fort Yuma Rotarians bent on bidding her a most fond farewell, and they did. Lizzy was surprised and pleased. Many hugs, both happy and sad, were exchanged. To ease the stress at the pump, the Parker family graciously received a $100 Chevron gift card courtesy of John Bornt & Shay Oil Co. to fill the tank for the trip. Lizzy received some other nice gifts and from the various Fort Yuma Rotarians. Chris Parker, Lizzy's mom, reports Lizzy arrived in Ecuador to temperatures in the mid 40s as Ecuador is amid winter and their toilets flush backwards! Everyone was happy to hear of her safe arrival.